We have worked with many leaders throughout the years and know first hand the extraordinary privilege and responsibility that comes with leading others. There are some common themes that hold leaders back from their greatness. Do any of these resonate with you? As we close out the year, it is a good time to reflect on the goals we set for 2017, progress made, and challenges overcome. It is also a good time to reflect on things that may have held us back from reaching our goals. In the last Leaders Evolve blog, we talked about lack of self-awareness as the #1 thing that holds leaders back. 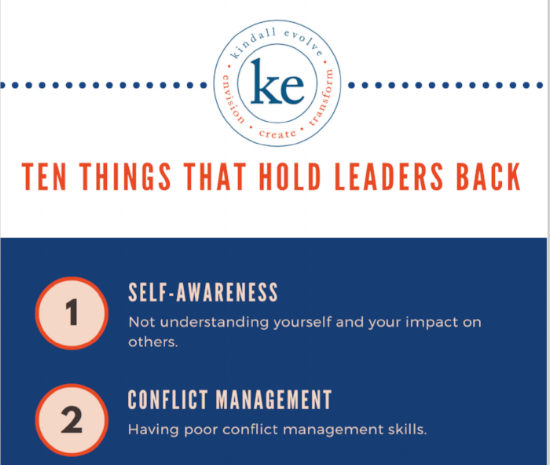 Here is another item on the Ten Things That Hold Leaders Back: having poor conflict management skills. Conflict is not always a bad thing. When avoided, conflict can fester and become harmful to the individuals involved in the conflict as well as other team members. Providing your team with skills to manage conflict is a powerful way to improve team dynamics. What can you do when there is conflict on your team? By engaging in this type of dialogue, individuals often discover that they have made invalid assumptions, typically in the absence of information. Assumptions are tricky and often result in conclusions that do not serve either party well (they are typically not positive). If both parties are open and willing to do the work to resolve the conflict, the negative assumptions will be clarified and positive solutions will be achieved. Communication, not avoidance, is the key! On a related note, I frequently ask leaders what their struggles are regarding giving feedback. The responses indicate that the lack of feedback stems from a desire to avoid a negative reaction, a flat-out denial, uncomfortable tension, or hurt feelings. ATTENTION: This is a form of conflict avoidance that can prevent your direct reports from performing at their highest level. Follow the tips above and engage in open dialogue with your direct reports. And yes, you guessed it; FEEDBACK (failure to give feedback, recognition and praise) is on the Ten Things That Hold Leaders Back list as well. Stay tuned. From years of working with leaders at every level, studying leadership and conducting research, we have identified key factors that keep leaders from being their best and getting the best from their people. We will begin sharing our list of 10 things that hold leaders back. This list is not all inclusive but, in our experience, these are the most common. Whether you are an emerging, experienced or seasoned leaders, focusing on these 10 things will help you create more engaging work environments and meet your strategic goals. This all ties back to the bottom line results of your organization, so please keep reading. Without further ado, here is #1 on the list of 10 Things that Hold Leaders Back. We are glad that you are joining us today as we celebrate the launch of Leaders Evolve! The goal of this blog is to provide information that accelerates your growth and success as a leader. We invite you to step outside of your comfort zone and take this accelerated leadership evolution journey with us.